This specification is essentially based on Designation BS EN 1977 : 2013 (Cu-ETP 1) and adapted to conditions unique to the Palabora Copper Rod continuous casting process. The casting process is using the Southwire continuous rod (SCR) technology to produce electrolytic tough pitch (ETP) copper rod in 8 mm diameter rod size. Electrolytic tough pitch (ETP) copper is electrolytically refined copper which contains mostly oxygen as an impurity. The SCR process is a combination of continuous melting, casting, rolling, pickling and coiling operations. Copper cathode is continuously melted in a vertical shaft furnace and continuously transferred to a cylindrical holding furnace which stabilizes the flow and provides uniform chemistry and temperature. Molten copper from the holding furnace is continuously transferred by means of covered heated launders to the tundish, which is located directly above the casting machine. The tundish is equipped with an automatic metal pouring system for the flow control of molten copper into the casting machine. The SCR system uses liquefied petroleum gas (LPG) as the combustion gas to melt the copper in the shaft furnace, keeping the holding furnace and launder system at optimal temperature. The SCR caster system consists of a wheel having at its periphery a groove which is closed by means of an endless steel belt which, in effect, becomes the fourth side of the mold. The mold is cooled by means of water sprays and the molten copper solidifies in less than 30 seconds. 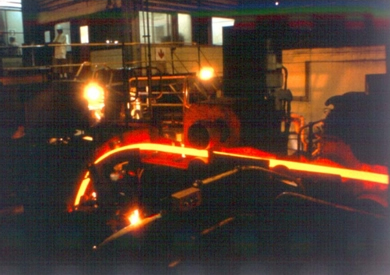 The bar comes out of the caster at a very high speed of 20 to 28 cm/s and is guided to an in-line, no twist rolling mill through a bar preparation unit. This unit removes the belt side corners and any loose scale or oxide adhering to the surface. The bar then enters the rolling mill where it is reduced to the final rod size by means of a series of vertical and horizontal roll stands. The rod exits the last stand at approximately 612 °C and enters an in-line alcohol based pickling system. The resulting rod has a bright copper colour and is free of surface oxides. Finally the rod is coated with wax to retard surface oxidation and coiled continuously into packages weighing on average 4.6 tonnes. This Specification covers pickled copper rods (diameters from 7,9mm to 14mm), produced from electrolytic Grade A (Cu-Cath-1) high conductivity copper cathode by continuous casting and suitable for further fabrication into electrical conductors. Orders for material under this specification should include the following information. The material shall be copper of such quality and purity that the finished product shall have the properties and characteristics proscribed in this Specification. Note: The following specifications define the required chemical composition of materials suitable for use. BS EN 1977:2013 (Cu-ETP1) Specification for Electrolytic Tough Pitch High Conductivity Copper, with oxygen levels generally less than 0,040% 02. The rods shall be continuously cast from hot metal produced by melting electrolytically refined copper, of chemical composition conforming to the requirements specified in Section 3. The rods shall each be furnished in continuous length with a PMC logo punched into the two ends of each coil, situated half way up the outer side of the coil. (14mm excluded). The resistivity of the test specimens as determined in accordance with 6.2 or 6.3 shall not exceed 0,017241 Omm2/m at 200C (Explanatory Note 2). Electrical resistivity shall be determined by resistance measurements (Explanatory Note 1) on representative specimens of the rods after cleaning and processing down to a diameter of approximately 2,0mm and annealing at approximately 5000C. Test specimens processed to a diameter other than 2,0mm may be used if agreed upon by the manufacturer and the purchaser. At the option of the manufacturer, electrical resistivity may be determined on representative specimens of the rods after cleaning, but without further processing and annealing. However, in the case of dispute, or in the event of failure of a rod specimen to conform to the criterion of 6.1 a retest shall be permitted using the procedure of 6.2. Electrical resistivity shall be determined in accordance with A.S.T.M. Standard Method B 193; except that when the option of 6.3 is elected the plus and minus tolerance for the cross-sectional area as specified in Method B 193 shall not apply. The diameter of the rod at any point shall not vary from that specified by more than the amounts prescribed as permissible variations in Table 1. 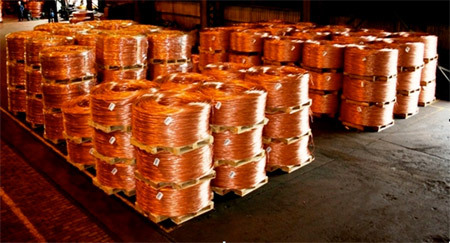 For the purpose of calculating weights, cross sections, etc., the density of the copper shall be taken as 8,89 g/cm3 at 200C (Explanatory Note 2). 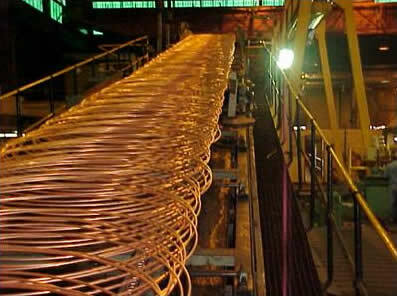 The value of density of copper is in accordance with the International Annealed Copper Standard. The corresponding value at 00C is 8,90g/cm3. Click here to contact us for more information on this product.